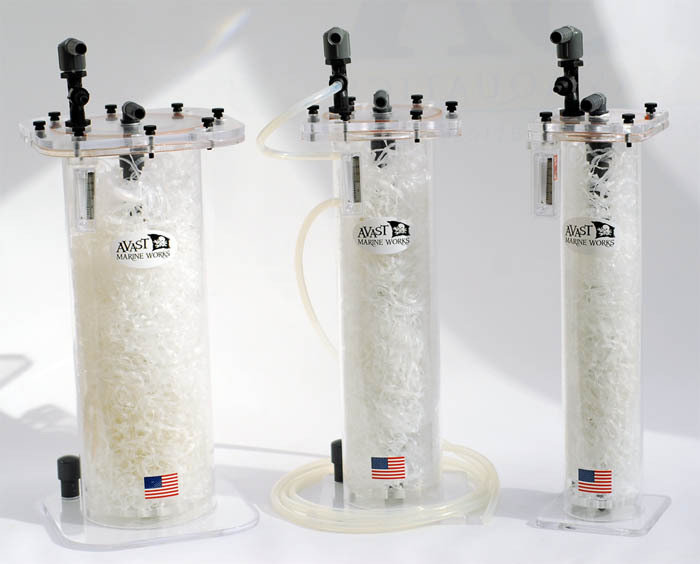 The AVAST Mutiny ozone reactor creates a pressurized environment where tank water can react with ozonated air. Inside the reactor, water is sprayed over high-surface area HDPE ribbon media. This allows for improved gas exchange and oxidation of organic matters. This method also increases contact time, as the water has to make it’s way through the media to exit. The AVAST Mutiny Ozone Reactor uses an ozone-safe Kynar venturi to spray the water/air mixture into the diffuser chamber. Inside the diffuser chamber, water is distributed over the ribbon media, then makes its way down to the bottom where it is forced up through the center tube. A pre-set internal pressure of 3psi (as long as the reactors are run with the recommended water pumps) is created with this flow method, eliminating the need for a pressure gauge.